Kick off your next gourmet gathering with these savoury starters featuring the perfect pairing of cream cheese, herbed=feta cheese, pesto and cherry tomatoes on crisp crostini. If you're expecting a large group, you're in luck. This recipe can easily be doubled. Place bread slices in single layer on baking sheet. Broil, 6 inches from heat, 2 min. on each side or until golden brown on both sides. Cool slightly. 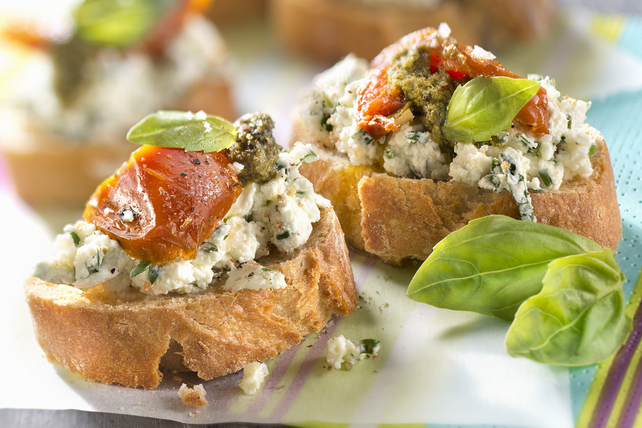 Mix cream cheese product, feta and pesto until blended; spread onto toast slices. For a flavour boost, drizzle crostini with Kraft Greek with Feta and Oregano Dressing before serving. Garnish with fresh basil leaves.